Our team has been hard at work designing and building a new multi-search function. 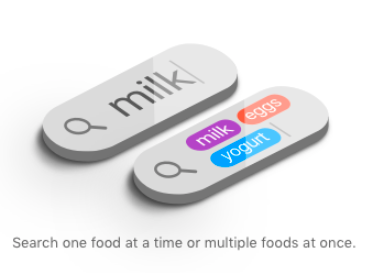 Users are able to search multiple items in the database (ie milk, eggs, yogurt) simply by putting two spaces after each keyword or a comma. The items in the search bar generate individual keywords in the search bar so when you tap “search” it will look for each item and display the search results on one screen. We hope it helps save you time so you can log your items even more quickly and get back to your busy schedules!